Orion the Hunter is a sure sign that winter is near. During the first two weeks of every December you can see him emerge above the eastern horizon at about 8:00pm local time. This heavenly cosmic giant rises horizontally, on his side, and is easy to spot. Look for his illustrious starlit belt. It is marked by three equally spaced bright stars lined up in a row. This famed Hunter's belt always guides you in imagining his hourglass physical form and always helps you discover several well-known heavenly bodies. Shown mid-December at 8:00pm for mid-Northern latitudes. The familiar winter constellation Orion the Hunter can be seen rising in the evening sky during Sagittarius (Nov. 22-Dec. 21), marking the approach of winter to the Northern Hemisphere, no matter what the weather is like. Whenever you see Orion just clear the eastern horizon at 8:00pm, you will know that the official beginning of winter, the winter solstice, is only 3 short weeks away. You'll notice that Orion rises higher and higher in the heavens, as the weeks go on, taking on his role as the lord the winter nights. Note: As horizontal Orion rises higher above the eastern horizon, he begins to align vertically, until he towers upright due south. By the time he lies above the western horizon he once again tips horizontally, this time on his opposite side. Notice where his reddish shoulder star, Betelgeuse lies in each direction. 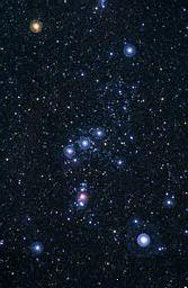 The two bright stars above (north of) Orion's belt are his shoulders, and the two bright stars below (south of) the belt are his knee and foot. Review images above. If you you draw your focus out from the middle star of Orions Belt, you will find that it points to the reddish star, Betelgeuse (Orions shoulder) on one side and the whitish blue star, Rigel (Orions foot) on the other. Helpful Image Look for his hourglass shape. Now locate the diagonal line of stars below his belt, this is Orion's sword. The red glow in his sword is the Orion Nebula (M42), a stellar nursery, where new stars are being born from a humongous cosmic cloud of gas and dust. The Orion Nebula is easily seen as a fuzzy star with the unaided eye. Look Up! In the evening sky, if you focus on the three stars in the Belt of Orion and follow them east, you will find they point to the brightest star in the heavens, Sirius, (see image below) and if you follow Orions belt west, you will find it points toward the reddish orange star, Aldebaran, the eye of illumination in Taurus the Bull (see image below). Hmmm ... Orion was once known as "the three Kings". The ancient name of Orion was "the three Kings", because of the three beautiful stars found in Orion's Belt. The Three Kings represent the three divine aspects of Will, Love and Intelligence, and Orion, therefore, symbolizes the spirit. The name Orion literally means "the breaking forth of light." The horizontal yellow line across the middle of the image is the ecliptic, the apparent path of the Sun, Moon and planets across the sky. The curved yellow line represents the eastern horizon. Look Up! View the gorgeous, giant Hunter of old. Set your imagination free and ponder on this. It is said that influential and potent forces are pouring in at this time from the great stars Betelgeuse and Sirius. These forces can aid in the service of those who are spiritually attuned. The forces streaming from Betelegeuse can stimulate the heart center, and the forces from Sirius are able to stimulate the head center. Meditating upon these stars is called for now, during this time of global transition. Follow these heavenly main attractions until bedtime, and be blessed in more ways than you imagined!